Technically, Jeff Adams ’85 and Tracey Morant-Adams ’88 were connected as sweethearts before they even knew each other. As a freshman, Tracey pledged Alpha Kappa Alpha. That year, Jeff, a UM senior athlete, was selected as the sorority’s Sweetheart. Later that same year, while taking Dr. Gary Rovelstad’s cost accounting class, Tracey requested a peer student tutor. While Jeff was one of the two recommended students, it still wasn’t yet to be, “I chose the other student,” she recalled, shaking her head. Having grown up in Alabama, Tracey was always aware of the University of Montevallo. Her mother, who was an educator, was very familiar with the school and its history of offering a quality liberal arts education as a public institution. Also, the ability to remain close to home was attractive to both Tracey and Jeff. Declining offers from several community colleges, Jeff chose to follow his brother — and an athletic scholarship for basketball — to Montevallo. This opportunity to create fond memories in a place that felt like home was something that deeply resonated with the Adamses. While they may not have romantically connected with each other during their time as students, they still each built solid connections with many other students and faculty. 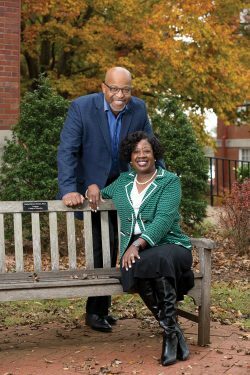 Jeff and Tracey both identify their degrees from the Stephens College of Business as the foundation that helped catapult their successes in the business world. Jeff now serves as the community relations manager for Blue Cross Blue Shield of Alabama. Tracey is the senior executive vice president at Renasant Bank and the chief of corporate social responsibility. Out of gratitude for the investment Montevallo made in them, the Adamses believe in the importance of giving back to the University. As a former athletic scholarship student and as the current president of the UM Minority Alumni Club, Jeff’s donations are directed toward the Athletic Department and to the work that the minority club does. “We also look at other needs and from time to time, we’ll find a need and try to get behind that as well,” he said.